Our range of products include fly ash brick press machine, fully automatic fly ash brick press machine, multi material fly ash brick press machine, multi-function fly ash brick press machine, semi-automatic fly ash brick press machine and chirag unique fly ash brick press machine. Ø Electrical system consists of Delta PLC control system and Delta Touch Screen, with data input and output; control system has safety logic control and trouble-shooting functions.Ø Hydraulic System: uses double high-dynamic proportional valves, which automatically adjust the oil flow and pressure, to guarantee the precise movement between the tamper head and mould.Ø Heavy duty machine structure, which is made of high density cast steel, is vibration proof.Ø Four rods guiding system and long guide bushing assure the precise movement between the tamper head and the mould.Ø Highly productive moulding device, which consists 360 rotating and compulsory feeding of raw materials, platform vibrating and compression shaping, greatly improves the cycle time. The finished blocks are of good shape and high quality.Ø Our machines, with harmonic cooperation between mechanical, electrical and hydraulic machines functions, guarantees a reliable and high production output of concrete products.Ø The moulds are changeable, and it is able to produce various kind of blocks,bricks,interlocks, pavers and kerbstones in different types, sizes, shapes, and colour layers. 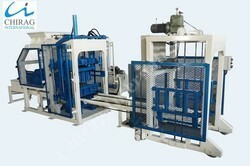 Ø With face mix device, its able to produce pavers with colour layer. Chirag Unique Fly Ash Brick Press Machine Heavy duty machine structure, which is made of high density cast steel, is vibration proof. Chirag Unique Fly Ash Brick Press Machine Our machines, with harmonic cooperation between mechanical, electrical and hydraulic machines functions, guarantees a reliable and high production output of concrete products. Chirag Latest Quality Fly Ash Brick Press Machine Highly productive moulding device, which consists 360 rotating and compulsory feeding of raw materials, platform vibrating and compression shaping, greatly improves the cycle time. The finished blocks are of good shape and high quality. Chirag Latest Quality Fly Ash Brick Press Machine The moulds are changeable, and it is able to produce various kind of blocks,bricks,interlocks, pavers and kerbstones in different types, sizes, shapes, and colour layers. Chirag Multi Speed Fly Ash Brick Press Machine Heavy duty machine structure, which is made of high density cast steel, is vibration proof. Chirag Multi Speed Fly Ash Brick Press Machine Our machines, with harmonic cooperation between mechanical, electrical and hydraulic machines functions, guarantees a reliable and high production output of concrete products. Chirag Powerful Technology Fly Ash Brick Press Machine Highly productive moulding device, which consists 360 rotating and compulsory feeding of raw materials, platform vibrating and compression shaping, greatly improves the cycle time. The finished blocks are of good shape and high quality. Chirag Powerful Technology Fly Ash Brick Press Machine The moulds are changeable, and it is able to produce various kind of blocks,bricks,interlocks, pavers and kerbstones in different types, sizes, shapes, and colour layers. Chirag High Performance Fly Ash Brick Press Machine Highly productive moulding device, which consists 360 rotating and compulsory feeding of raw materials, platform vibrating and compression shaping, greatly improves the cycle time. The finished blocks are of good shape and high quality. Chirag High Performance Fly Ash Brick Press Machine The moulds are changeable, and it is able to produce various kind of blocks,bricks,interlocks, pavers and kerbstones in different types, sizes, shapes, and colour layers. 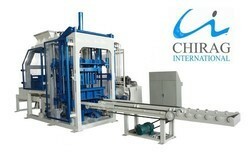 Looking for “Fly Ash Brick Press Machine”?